In Robin Wood's 1981 introduction to his seminal study of Howard Hawks, Wood cites "an extreme and habitual self-consciousness" as a characteristic of modern art, one to which he has an ambivalent response; citing Losey's Eve, a film he expresses a qualified admiration for, he enumerates several shots containing an "insistence on significance." The most egregious, to Wood's mind, being a "waste of a whole camera movement" to show the viewer that a character in the film is reading Eliot. "This kind of thing is so alien to Hawks that I am almost at a loss to find anything in his films sufficiently like it to make direct comparison possible," Wood continues. "[B]ut there is one such moment in Red Line 7000. Julie (Laura Devon), the sheltered younger sister of a race-team manager, sits waiting for her lover, one of the drivers, who has in fact left her. She waits most of the night, with an opened bottle of champagne on the table before her, and when her brother comes to find her, and tells her he has seen her boy-friend out with other women, she looks at the bottle and murmurs that the bubbles are all gone. It's not a profound bit of symbolism, but the point is that Hawks doesn't treat it as if it were. It arises naturally from the scene[...]"
The scene, and Wood's description of it, crossed my mind recently when I watched a restored version of Alfred Hitchcock's 1927 melodrama The Ring, playing tomorrow night on the big screen of the Harvey Theater as part of BAM's presentation of nine silent movies by the master director. The Ring is an unusual Hitchcock picture in several respects. For one thing, it's the only Hitchcock picture for which he is credited as the screenwriter; for another, it's not a suspense or crime picture but rather an odd romance in which an up-and-coming boxer has to cope with an imposed romantic rivalry. The movie's sexual politics seem a mix of the tenor of the times and Hitchcock's own damage, and will no doubt prove scintillating to some latter-day observers, but are not the concern of this consideration. There's an extent to which what may be considered symbolism and what is in fact metaphor may smear into each other, the way chocolate smears into peanut butter. Near the climax of The Ring, the protagonist, Carl Brisson's Jack, wins an important bout, and he and his cronies repair to his place to celebrate. The absence of Jack's wife, known in the film only as "The Girl" (Lillian Hall Davis, and what did I tell you about the picture's sexual politics?) is noted, but Jack assures the fellas that she ought to be back soon. In the meantime, champagne! Jack pours it out. and there they are, gone. And in the event you needed more emphasis on the literal, metaphorical, and perhaps symbolic fact, Hitchcock dissolves once more, to the whole tray of flat drinks. (N.b., the screen captures here are from a 2007 DVD issue of the film, not the excellent restoration BAM will be running.) What Hitchcock accomplishes with this effect, the economy of which belies what must have been some pretty elaborate preparation in order to pull off, is kind of remarkably multivalent. Via the dissolve, he sculpts in time, demonstrating its passing while also showing the life, the liveliness, going out of the ostensible celebration. Jack's victory is an empty one, because his wife is in fact out on the town with his rival...the man he will, as the scenario has it, have to face in the title ring for the final, you know, showdown. The champagne effect is one of the most striking in a movie that is full of cinematic storytelling touches that were innovations at the time and subsequently became part of the lingua franca. Most of the pleasure to be had from The Ring today is seeing Hitchcock working out his ideas; his cinematic apparatus, while remarkably assured, isn't entirely refined. But there's a raw exuberance to the way he throws one effect after another. For the next thirty-plus years of his career, you never see that enthusiasm flag, but you do see it applied more virtuosically. While this movie plays awkwardly to that bugaboo of cinephilia, the "contemporary sensibility," it's also entirely clear that in The Ring, Hitchcock isn't just learning the ropes, he's making them. In a move that I find kind of staggering, the e-zine Slate has posted a film-related article that's not only entertaining and provocative, but erudite and spot-on. The astute and hard-working Dennis Lim introduces, and walks the reader through, a series of ten clips illustrating the evolution of the cinematic fight scene—from wide shot, bare-knuckled brawl to shaky-cam frenzy and, in a clever twist, back again, commending the reader to the excellent analyses of David Bordwell along the way. My only quibble is that its "history" begins in 1958—surely the silent-screen fight warrants some coverage? Despite that, it's good stuff, and an excellent use of the video slide-show medium. Of the many film fight scenes that usually get discussed (Shane, From Here To Eternity, On The Waterfront, Bad Day At Black Rock, From Russia With Love), one that is often overlooked but has stuck with me just the same is the climatic, three way, life and death, bloody struggle from Jonathan Demme's Something Wild. Watching lovers Melanie Griffith and Jeff Daniels fight for their lives against psychotic ex-husband Ray Liotta was tough to take. What made it more disturbing was that it came towards the end of what I thought was a hip screwball comedy. It was as if, Bringing Up Baby had switched gears and became Straw Dogs with little warning. 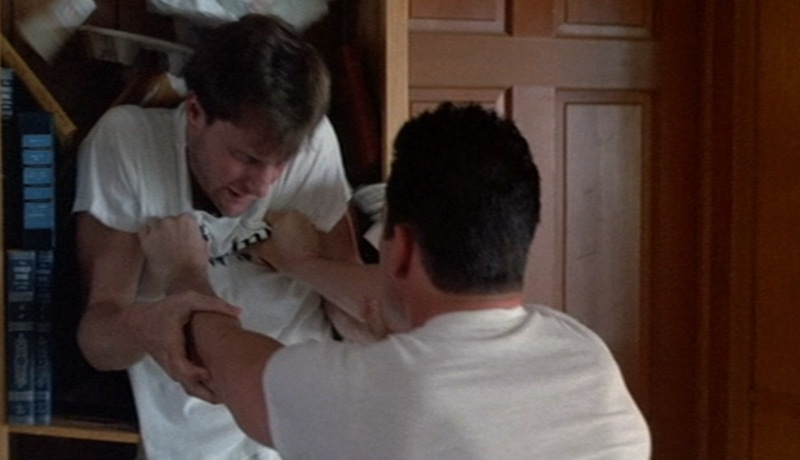 During this realistic and painful scene, Daniels takes a very cruel beating, his arms are nearly pulled from their sockets (is Daniels double jointed? ), before he's able to get a hold of a weapon. I asked myself why Demme would put his characters (and the audience) through such a grueling experience? I knew Demme was a devotee of Hitchcock; as he stages most of the fight within the confines of a bright and spotless bathroom, echoes of Psycho are already present, but it wasn't till I heard him speak of his admiration for Torn Curtain that it all became clear. He actually manages to reference that film's center piece, the slow, brutal murder of an enemy agent at the hands of two characters with far less experience in violence, and use it to his advantage. By switching tones so suddenly, he successfully pulls the rug out from under his audience, and sets it truly off balance, which these days is not as easy as it sounds. I never doubted Demme could return to his exploitation roots, I just didn't know he'd do it when I least expected it. I hear ya, Joe. I got a little queasy just pulling up this screen grab.